While season 6 of The Simpsons is still in its golden period, long before just about any estimate of shark-jumping I’ve ever read, I consider it a bit of a dip in the show’s consistent quality. This seasons has some duds and feels short on ideas, especially since season 7 feels a fair bit stronger. Crossovers have never tended to elevate The Simpsons in any way, and this season’s jarring insertion of the main character from The Critic for one episode is perhaps the most egregious example. On the other hand, there are some very strong, classic episodes here. Season opener ‘Bart of Darkness’ is a classic well-written episode with a silly final reveal. Sideshow Bob gets another memorable episode running for mayor in an ever-more-relevant episode about populism. Lisa proves to have hidden skills in ice hockey and Bart gets his heart broken again, apparently forgetting the last time. This is also the period where I begin to clearly remember episodes from my childhood. 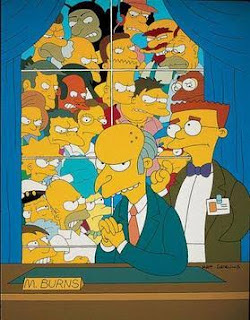 ‘Homer Badman’ was certainly amongst the episodes I saw first (being in the UK, I can’t claim to have been an early fan), and I remember when the mystery of who shot Mr. Burns was a genuine unsolved cliffhanger. Patty and Selma continue to have surprising depth, but Mr. Burns becomes a bit more cardboard at this stage. Flanderisation is in progress, but he still has the capacity to surprise, and the last act of ‘Bart’s Comet’ is one of my favourite Simpsons moments. Another Simpsons staple that I don’t really like begins here, with Bart going to Australia and wreaking havoc. Over the next several seasons the Simpson family will visit a variety of countries and the writers will fall back on lazy stereotypes. The only episode in this vein I actually like is the visit to Japan, and even that only for the final reveal of the parts that make up the Mr. Sparkle mascot – probably my favourite joke in the show’s history. But that aside, whenever the family heads to another country, the humour takes a hit, no matter how quotable lines about ‘Knifey-Spoony’ may be. Even back then, people loved to question whether The Simpsons had outstayed its welcome, whether it was growing stale. It would have a very long way to go before it could be called past its sell-by date. But that day was coming and some early indications were even then becoming visible.